The structures of the spine are under constant stress as we bend, lift, and move through our days. Sciatica is a type of back pain that can happen when the sciatic nerve is pinched, impinged, or becomes inflamed. The pain is often accompanied by weakness, numbness, or tingling which can travel down through the buttocks and into the thigh. between the lower vertebrae in the back, gets pinched or impinged upon by a bulging or herniated disc, or is irritated or inflamed, the pain can be debilitating. Many sciatica sufferers describe their lower back pain as excruciating. There are some simple steps you can take to help reduce your chances of injury and pain. 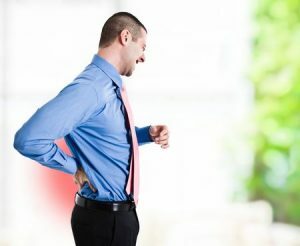 Exercising your core muscles, proper lifting and exercise techniques, and proper attention to diet are all important in how to minimize back pain. Not all back pain is related to the sciatic nerve. It’s possible to tear or pull muscles in the lower back, causing microscopic tears in the muscle fibers themselves. In order to allow those tears and strains to heal, it’s important to work with your doctor in a physical therapy program that strengthens your core muscles- the muscles of the lower back and abdomen that work together to support the spinal structure. When standing, take a few minutes to stretch and bend. Slowly lean to one side, then to the other, bending at the waist. You should feel the stretch in the lower muscles of the back. When lifting, bend at the knees rather than at the waist and carry the weight close to your body. Do not lean forward to place heavy objects, as this puts unnecessary strain on your lower back. If necessary, get help lifting heavy objects, especially if they’re awkward and difficult to hold on to. Make sure you’re sleeping on a firm mattress that offers good support and alignment. Don’t let lower back pain rule your life. Talk to your doctor today about exercises and steps you can take to keep your back healthy and strong.